They're lean, they're fast-loading and they come in a great variety of lovely designs. 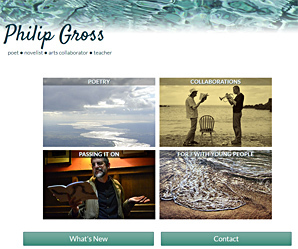 Philip Gross is an award-winning poet, children's novelist, librettist and all-round advocate of the written and spoken word. Since his retirement from lecturing he has re-immersed himself in poetry, performances and collaborative works to beguile the imaginations of children and adults. The website has an interactive element for sharing snippets of poetry or answering questions from readers. The main body of the site showcases Philip's vast back-catalogue of literary works, including sample poems from every published volume and links to readings on SoundCloud. Janie's Stringing has restrung pearls and beads of all types for more than twenty years, for trade jewellers and for individuals. Some of her pieces have won awards, others have taken part in an exhibition in the British Museum! 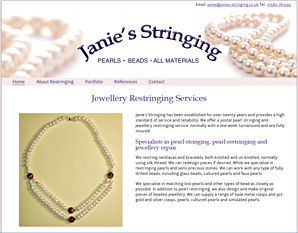 This small website showcases her work and explains the different types of jewellery stringing. This upmarket boutique bed and breakfast is a new venture for Zoe Meyer, a keen cook. Zoe has indulged her love of beautiful design to turn her home and garden into welcoming spaces for visitors. Her own photos enhance this website with galleries of expanding pictures. Rooms reservations are handled by the online booking system FreeToBook, which is seamlessly integrated into the website. 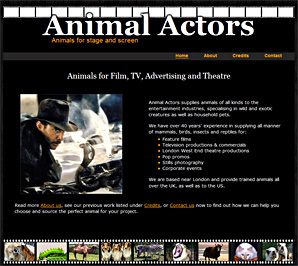 Animal Actors have worked in the film industry for more than 40 years, supplying snakes for Indiana Jones, spiders for James Bond and other exotic beasts and household pets for stills photography, commercials and theatre. Their ancient website needed a modern overhaul, and with great pictures of their animals and of iconic film scenes, it was a really enjoyable challenge for Applegreen. 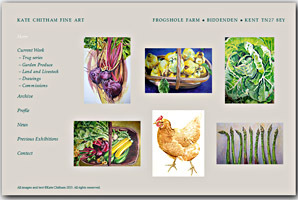 Fine artist Kate Chitham specialises in paintings of garden produce, chickens and landscapes. 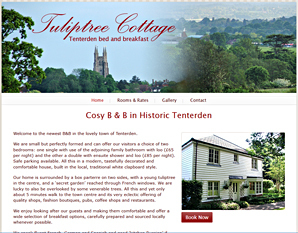 Her gorgeous website, which showcases her work beautifully, was given an unusual technical twist by Applegreen. The images do not resize as the screen size changes, they simply rearrange themselves. 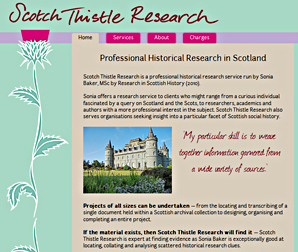 Sonia Baker runs this professional historical research consultancy from her base in Scotland, and she is passionate about Scottish history. 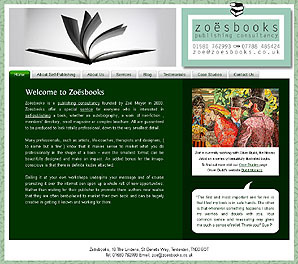 The website was designed by Kate Chitham in scrumptious colours and with some beautiful hand-drawn elements, with mobile-friendly implementation by Applegreen. A very fruitful three-way partnership. 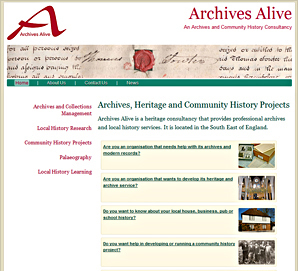 Experienced archivist Nicola Waddington wanted a website that would showcase the diverse strands of her work. This lovely, mobile-responsive design is the result of a real partnership between her and Applegreen. Nicola made extensive use of case histories from her many projects to demonstrate the breadth of her involvement in the field of local history, records and archives as well as community projects and training. 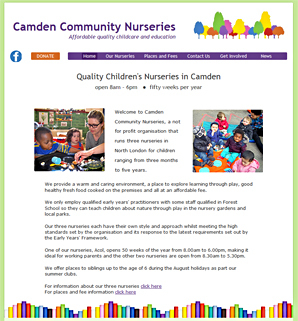 This thriving group of three not-for-profit children's nurseries in north London wanted to revamp their website. We used their original logo and reworked the design to give a fresh, updated look. In keeping with young parents' fondness for mobile devices, this website was made "responsive" in order to be read easily from mobile phones and tablets as well as ordinary computers. The website is hand-coded but includes a WordPress blog, integrated as the News page. 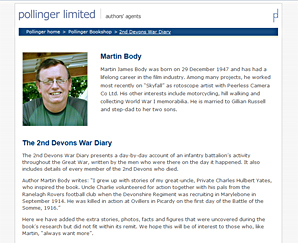 This "mini-site" matches the look and style of Pollinger Ltd who publish and distribute books on behalf of a range of authors. It presents all the extra information that did not fit into Martin Body's book, which is inspired by his great-uncle who was killed during World War I. Some pages still in pdf form are slowly being converted to web pages with beautiful expanding photographs. Check out Martin's own design feature: the "real" bullet points! 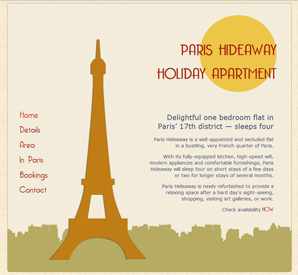 The website for Paris Hideaway is designed to resemble an Art-Deco poster with special font to match, as a nod to the predominant style in that part of the City of Light. Here a visitor will find all the details one would want to know when choosing a furnished apartment for a short stay in Paris, with gallery of expanding photos, availability calendar and extra space for articles about the district and about Paris itself. Understandably, Kate wanted to control the look of the website that showcases her work in several artistic fields. 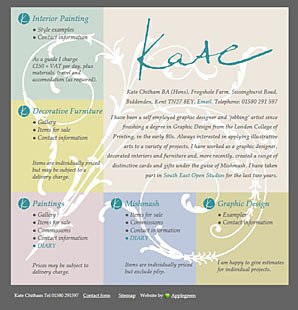 The result is interconnected squares in soft, pastel colours with delicious swirly watermarks hand-drawn by Kate herself. Applegreen enjoyed rising to the technical challenges of this unusual project and is very pleased with the result of our joint efforts. Run by Anna Foster, this small company helps people turn their memoirs into books as gifts for their families and friends. 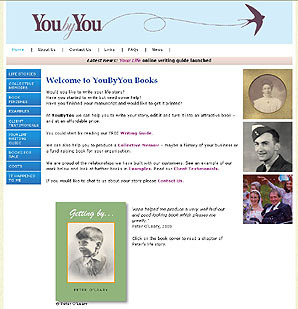 The website abundantly showcases the work of YouByYou, demonstrating book types and examples to the prospective writer. It also includes a comprehensive guide to writing and producing a life story book. Illustrated artists' books, poetry compilations and innovative children's stories have all been successfully produced through Zoe Meyer, who gives individual attention to all her projects. Her website explains her approach and shows the breadth of her work, adding useful testimonials from clients. The original design was by Blackandwhitepixels with updates and ongoing management by Applegreen. Frogshole asparagus is famous in Kent and fans like to know when it's available. The website gives up-to-date information together with recipes, cooking tips and illustrations. 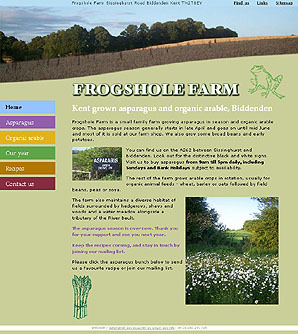 One beautiful page describes a year in the life of the farm which also grows organic crops. A simple contact page enables asparagus afficionados to sign up for an email alert informing them exacly when their favourite delicacy is ready to buy.